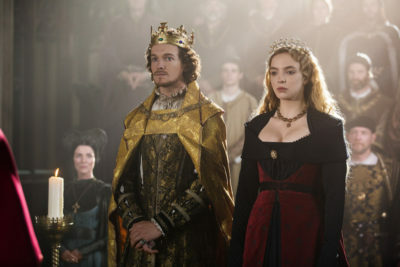 RECAP: 'The White Princess' Season One, Episode Two "Hearts and Minds"
On The White Princess, Henry seeks to solidify his sovereignty through Royal Progress and Lizzie’s under house arrest. Here’s a look at “Hearts and Minds”. This week on The White Princess, Henry and Lizzie find themselves in different parts of England as Henry embarks on Royal Progress. Basically a journey around England to collect taxes and allow the Lords to pledge fealty to him. Lizzie’s originally supposed to ride with him, but Lady Margaret has other plans entirely. “Hearts and Minds” opens with Lizzie being dressed and then being told that Henry wants to see her. She makes her way to Henry, and he asks how she’s feeling to which she nearly brushes her lips against his cheek to whisper in his ear that her morning sickness has almost passed. There’s a near kiss before Lizzie seems to gather her wits and pulls away. 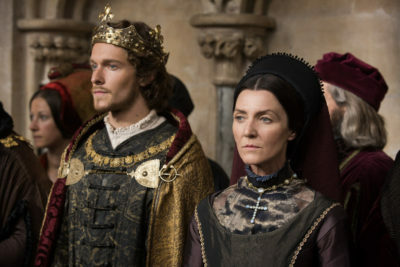 Later that day, during a performance at court, Lady Margaret meets the new chaplain and explains to him that Lizzie has a role to play in court, but her mother doesn’t. Elizabeth is playing her hand to openly for the Lady Margaret, and these two will obviously always be at odds. When Lizzie goes to speak to her mother, Margaret goes to cut her off to introduce her to the Bishop. Elizabeth tells her that Lizzie’s dress is causing the baby discomfort so they’re going to change. Lizzie and her mother walk away quickly before the lady’s maids can tag along and listen to the conversation that quickly passes between them. Who will further the York cause? Lizzie tells her mother that Francis Lovell is the man Richard trusted the most, so Elizabeth decides that he’s who they will call on to help get rid of Henry. With that decision done, the lady’s maids finally catch up and enter the room after all the important details have been straightened out. Outside, Henry’s praticing archery. He’s not sold on the idea of Royal Progress, but his mother tells him that he needs to show himself off. Oh, and that he has to carry a sword because it’s not safe if there are any York loyalists still lurking around. Watch this scene and appreciate Henry’s skill at archery…and the words. Pay attention to those, too. This doesn’t sit well with Henry, and when he’s speaking to his mother and Uncle Jasper later on, he tells them of his plans to visit York. When they try and dissuade him, he tells them that he won’t let them think he’s afraid. And just like that, Lizzie has his ear. True to character, Elizabeth is busy plotting while Lizzie is writing a letter to Francis Lovell. She pays the lady’s maid, Ruth, to take the letter and not give it to the Queen Mother, but while Ruth’s gone, she hides the real letter to Lovell in her daughter’s skirts. Once outside, she hands off the letter to Ned, the stable boy, who takes it the rest of the way. The note Margaret ends up with talks about how bad her son is in bed, and to be honest, her face alone is worth the scene. She burns the letter without telling Henry about it. Lady Margaret does some meddling of her own and speaks with Cecily about her happiness, and that her mother, Elizabeth, must be feeling left out and overshadowed due to her status being struck down. Cecily tells her that her mother always finds a way, just like Lizzie. And just like that, Cecily becomes an even bigger snake to her own family. Taking Cecily’s words, Margaret goes to Lizzie while she’s packing and tells her that she can’t go on Royal Progress due to her pregnancy. At this, Elizabeth steps forward and offers to take her daughter’s place. For the moment, she feels like she’s out maneuvered Margaret. That night, Henry is sitting in bed and Lizzie is standing at the foot of the bed. She asks if he’ll write her and he tells her that he will. It would do good if the country thought their love was real. Then he flings back the covers and I guess he’s inviting Lizzie to bed? It’s not the smoothest move. The next scene finds us walking with Lizzie and Elizabeth as they talk about Elizabeth taking one last turn as Queen on this Royal Progress. They’re stopped by Margaret who tells them that Lizzie needs to be seen by the midwife, and that the Bishop wants to speak to Elizabeth about Lizzie’s care while she’s away. This ends up with Elizabeth and her daughters being locked away in a tower in Westminster because Margaret thinks she was plotting against Henry (which she was), and that she won’t be allowed out until Henry gets back. She springs into action as soon as the door is locked. She has one daughter watch the window, tears another bit of cloth from one’s dress and then proceeds to write a letter, in blood, to through down to Ned when he passes by. If you doubted Elizabeth’s dedication to the cause, there’s no need to anymore. She’ll do anything to get Henry off the throne. As Ned passes by, she tosses her ring at him to get his attention, but it misses, and he rides on. Around the castle, windows are being boarded up, and when Lizzie asks about it, she’s told that she’ll be able to spend time in her rooms until the King is back, but they’re shutting off the rest of the castle since most of court is gone. Lizzie tells him that if she can’t have her mother, she wants her Aunt Cecily to visit her. In her rooms, Aunt Cecily comes in and tells Lizzie that she’s leaving for Burgundy. She thinks Henry and the Tudors are monsters and that if she stays, she fears she’ll be killed. Before she leaves the room, she tells Lizzie that she must look to her mother for guidance. Back in the tower, Elizabeth is twirling a piece of horse hair between her fingers and willing Ned’s horse and Ned to come back by the window. It works because he comes by and the horse spooks at the ring on the ground and Elizabeth is able to throw down the letter. He gets it and rides for Francis Lovell. The contents of the letter tell Francis that it’s up to him to stop Henry and that he must do whatever he can to help the York cause. In simpler terms, Kill the King and help us put Teddy on the throne. Which is super bad for Teddy seeing how the poor child can’t keep his mouth shut to save his life (literally). Once Henry’s in York territory, the assassination attempt takes place. The arrow misses Henry but he is stabbed in the arm. Jasper chases after Lovell, but loses him when some knights block his way. They’ve switched sides from Henry to York, and support Teddy for the throne. Before they started out on Royal Progress, news reached London that “the sickness” was west, but Margaret hadn’t seemed too concerned. In York, the sickness is more noticeable, and because his mother left him in the dark, he appears stupid in front of the men who show their concern that he would come because of the illness. In London, the sickness has reached there now, too. People are dying left and right, and Lizzie is still in her rooms. She expresses concern that her mother hasn’t written her and asks Maggie to go see if Ned has heard anything. Ned sends her back inside the castle, telling her that the sickness has spread and that Elizabeth is just in the other tower, locked away. Maggie asks Cecily what they should do, she tells her that they don’t need to tell Lizzie anything. She would go outside to try and find her mother, and she’d risk herself and the baby out in the sickness. Lizzie does receive a letter from Henry, though. He accuses her of instigating the failed assassination attempt and writes that if her mother had accompanied him, she wouldn’t be alive. After this, she knows that her mother has been locked in the tower and goes to seek her out. Lizzie understands that Maggie and Cecily have known about Elizabeth, but they didn’t want to tell her because of the sickness. When Lizzie learns of the extent of the illness, she goes the vault for gold. At Westminster, Lizzie is ordering the vaults be opened so that she can get the gold and give it out to the people who need it. The Bishop tries to stop her, but she pretends (?) to start aborting her baby, telling the Bishop that she’ll kill the baby and herself if he doesn’t get out of her way. After telling her she’ll be judged for her sins, he leaves in a huff, and Lizzie gets the gold. She sets out a plan to deliver it and bread to all the sick people in the city. Once she’s finished there, she goes to visit her mother. Elizabeth isn’t happy with Lizzie for offering help to the sick people because if they think Henry brought down the illness, they’ll turn on him. Lizzie doesn’t want innocent people to die for that, and she also berates her mother for trying to have Henry killed without consulting her first. Elizabeth thinks that Lizzie’s feelings towards Henry’s death have changed, but Lizzie tells her that she feels the same except her mother is way too obvious with her actions, and now that Lizzie is the Queen, or will be, she’s making the decisions. Lizzie writes Henry a letter and tells him that it wasn’t her that ordered the attempt on his life. In York, Henry finally finds out that soldiers are switches sides to Teddy’s and that the people are blaming him for bringing the sickness to England. He makes the decision to lock Teddy in the Tower of London to prevent the York cause from gaining anymore momentum. Teddy is torn away from Maggie at Westminster, and when she runs to Lizzie, we find out that Cecily has been writing to Lady Margaret the entire time. Cecily has got to go because she’s the most unloyal sister ever. On his way home, Henry is greeted by villagers kneeling and thanking him for the gold and bread. He has no idea what has happened until he reaches Westminster and is told what Lizzie has done. His mother tells him to punish her, and Cecily warns Lizzie that Henry will be mad and that he has every right to be. In a brief meeting with his mother, uncle, stepfather, and a few others, Henry’s told that Burgundy is a problem, and he decides to send a peace envoy. Margaret volunteers her husband, but Henry shuts that down, and send Jasper in his place since he’s unmarried. The episode ends with Lizzie and Henry on a small high note, him feeling the baby kick, before Margaret orders Lizzie to confinement due to her condition. When Lizzie tells him that it’s his call, Henry remains silent. His mother still has control over him. Lizzie goes to her room. Elizabeth and her other daughters are locked away still, and poor Teddy is still in the Tower of London. We can’t wait to see what awaits the envoy in Burgundy! Also, just what bonding happens between Lizzie and Henry? What are your thoughts and theories?